I picked up a pound of Chanterelle mushrooms yesterday, since they are abundant and cheap right now. 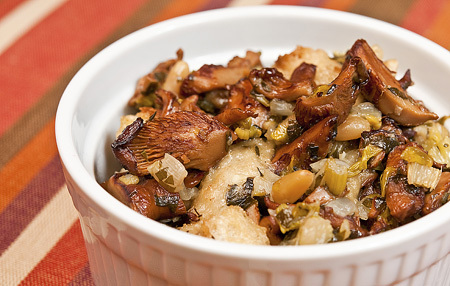 I was making a chicken for dinner, so I did a search for chanterelle stuffing. I needed it to be gluten-free, so I knew I’d have to modify the recipe I found. Luckily, last night I made gluten-free whole grain bread from a package mix from Bob’s Red Mill Natural Foods. It turned out really good and not at all heavy like some gluten-free breads. Early today, I cut some of the bread into cubes and let them exposed to the air since I wanted to use them in the stuffing. Below is the recipe I modified for the stuffing. Preheat oven to 350°. Soak bread cubes in 1 cup of the stock. Chop the chanterelles. Heat a large saute pan over medium-high heat. Add chanterelles and dry saute them, stirring them occasionally, until they give up their water. When most of the water has cooked away, add the butter, celery and onion. Cook 3-4 minutes until the onions are translucent. Sprinkle liberally with salt, then add garlic, thyme and pine nuts. Cook another 2 minutes. Pour contents of the saute pan into a large bowl and mix with the bread cubes and parsley. Add more stock to made the mixture quite moist. Press into a greased casserole dish. Cover with foil and bake for 30 minutes. Remove the foil and bake for another 10-15 minutes.